I had a very good first week after the coaching sessions. Several times I was under control due to a lot of discussions with you. I regret that I did not make this training earlier. I am really pleased and proud to be coached and trained by you! Your expertise exceeds my needs. Sheida Hodge is internationally recognized as one of the leading experts on cross-cultural and international business. With over 25 years of business experience, she is the founder of Hodge International Advisors--a cross-cultural speaking, training, and coaching firm in Seattle--offering key note speeches as well a full range of services focused on helping executives succeed in cross-cultural and international business. Ms. Hodge has authored a book: Global Smarts: the Art of Communicating and Deal Making Anywhere in the World published by John Wiley & Sons. She has an MBA and a BS degree in mathematics. Ms. Hodge's most recent work includes speaking at conferences and conducting cross-cultural training programs for Bayer, Booz Allen Hamilton, Colgate, Ralph Lauren, Honeywell, Thyssen Krupp, The Gucci Group, Hugo Boss, European Relocation Associations, Thomson Prometric, Plastics Industry Association, and the University of Washington. Her programs won rave reviews, and provided members of the audience with critical insights toward achieving continuous success in their cross-cultural and international business endeavors. Over the past several years, Ms. Hodge has been invited to speak and conduct cross-cultural training programs on international and cross-cultural topics in Japan, China, Singapore, Hong Kong, Malaysia, Thailand, France, U.K., Germany, Portugal, Italy, Hungary, The Czech Republic, The Netherlands, Belgium, Austria, Mexico, and Brazil. 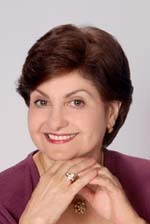 She has also presented cross-cultural programs at major conferences such as ASTD, ERC, and SHRM. Ms. Hodge has designed, developed, and led advanced courses on cross-cultural communication and cross-cultural negotiation skills at the University of Washington's Global Executive MBA program, UCLA, the University of California Irvine, and Thunderbird. Through her first-hand corporate and international business experience, Ms. Hodge's extensive knowledge and broad perspective deliver a comprehensive, highly effective approach that is readily applicable to business interactions. Whereas many speakers merely aim to just heighten sensitivity and discuss theoretical issues, Sheida goes several steps further to another level: she shows the practical business implications of these insights-enabling participants to implement the tools they learned within their organization for immediate, tangible results. Ms. Hodge began her career with GE, where she gained invaluable international and cross-cultural experience traveling to Asia, Europe, Latin America and the Middle East in support of GE's international business development. More recently, she led the Berlitz International's Cultural Consulting Division as its Worldwide Managing Director. Ms. Hodge has been quoted as a leading expert in her field in such major publications and television networks as The Wall Street Journal, the Chicago Tribune, the Orange County Register, CNBC, and CNN. She has also published numerous articles in major trade publications. Ms. Hodge speaks and conducts seminars on Cross-Cultural Communication, Global Teamwork, Global Diversity, Global Leadership, Cross-Cultural Negotiation and Successful Sales and Customer Service in the Domestic Multicultural Marketplace. Her energetic, upbeat and positive style inspires people to implement her creative business solutions and achieve measurable results. Her programs are highly interactive, visual, and humorous.